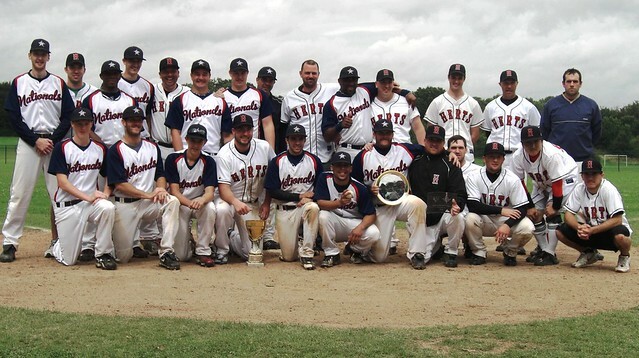 2012 was the most successful year in Herts Baseball Club’s history in every department on and off the field. It continues to be one of the largest baseball clubs in Great Britain in terms of size, infrastructure, financial performance and is now beginning to mount a serious challenge on the field at every league level with 4 out of the club’s 8 teams reaching the postseason in 2012. To review 2012, we are publishing excerpts from the End of Year Report at the club’s Annual General Meeting. The arrival of some of the country’s best players before the start of the 2012 season has turned not only the Herts Falcons but the remaining Herts adult league teams into title-contenders. Last year the club had 3 teams and they all ended the season below the .500 win-loss percentage. This year the club had four teams and each ended the year at or above .500. Despite this being the best ever season for a Herts team in the top league of British Baseball, the Falcons felt disappointed to lose in game 6 of the National Championship Final and this is another indication of the amazing turnaround for the club this year. The club’s second team, the Herts Hawks, also reached the postseason going out in the semi-finals. The success has been a well-deserved reward for co-managers Andy Cornish and Greg Bochan who never gave up despite several very difficult losing seasons. The club’s success of attracting players who have never played baseball has historically resulted in lack of competitiveness at the Single-A League level, however, even there the club’s two teams turned the corner and despite missing out on the postseason they were both in with a chance of the playoffs right down to the final day of the regular season. Arnie Longboy and Duncan Hoyle should be very proud of what they have achieved in their first seasons as Herts managers. Duncan had the toughest job out of all team managers as he had the last pick from the club’s pool of players. He decided not to accept this predicament and went out to recruit more players through various channels. Overall there was a 46% increase in adult players this year – which is unprecedented, especially for a club which already had one of the largest pools of players in the country. Success is usually measured by whether a trophy was won or not and on that basis Herts would not be considered a major player in the British youth leagues in 2012. However, those with inside knowledge of the youth leagues in this country would say that Herts is seen as the model for others to follow. The youth programme is positioned very well to offer a high quality product for every young player, from a beginner who is keen to give baseball a try to an advanced player aiming to play at the highest level of the game and represent their country internationally. With growth of 12% in youth players this year and plans for further grow, the club would be in an even better position to do this in the coming years. The Herts U17 and U14 teams did not win the championship this year but they are very much on track to be a major contender when this Herts generation reaches the final year of the 3-year cycle in the respective age group. Cris Hiche took charge of the U17 team and we are already seeing significant progress, earlier than we could have expected. Last year the team lost 11-10 in the quarter-final against the Essex RedBacks. This year the two teams met at the same stage and Herts won convincingly 23-0. The team is also starting to challenge the favourites like the London Mets and had a .500 record in the regular season games against the eventual champions, Cobham Cougars. This has raised expectations for 2013 when this generation of U17 players is expected to reach its peak and aims to win the title in the same way as they did in 2010 at U14 level. The Herts U14 team reached the final last year, however 7 players from that team moved up to the U17 age group which meant that 2012 was a transitional year. The team is expected to be at its peak in 2014 and 2015 and performances this year indicate that with hard work over the next few years this new generation of U14 players can be just as successful as the previous one. The coaching staff of the Herts U11 teams made a deliberate shift in its approach. The number of league games has been reduced in favour of intensive training sessions. This has meant that players are able to perform greater number of repetitions which is critical in developing the fundamental baseball skills at this age. The progress has been remarkable and the U11 coaches should be very proud of what they have achieved. Coach Mike Wakelam even managed to add extra summer sessions for the U11 players at the ballpark and the batting cages in Northwick Park. The players are recognising the extra effort made by the coaches and they are responding by working even harder. The Club received a tremendous boost at the beginning of the year with the announcement that its grant application has been successful and it has been awarded £10,000 by BaseballSoftballUK (BSUK), the development agency for baseball and softball in the UK. The club added further £7,000 of funds raised by its members over the years to invest around £17,000 to install the perimeter fence around the two diamonds enclosing the venue completely and installing four dugouts, two for each diamond. Grovehill Ballpark is currently the best baseball venue in the country attracting the biggest events in the British Baseball calendar, including this year’s National Championships which is the showpiece event of the year. The club’s incredible concession stand team set a new record this year. Sales for the year were £3,770. 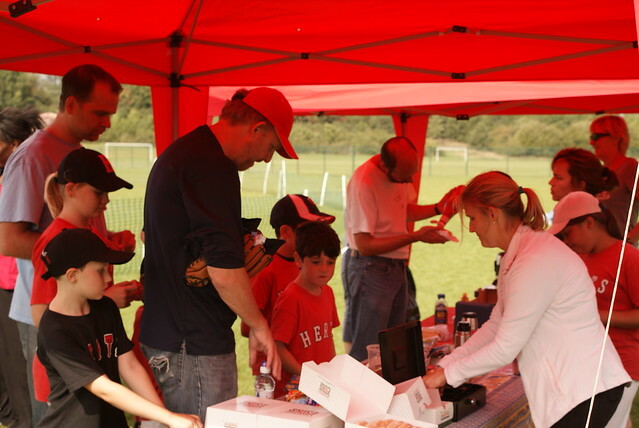 The catering activities help raise funds which go not only towards ballpark development, but also help subsidize youth membership fees making Herts Baseball one of the most affordable sports clubs around for kids. Astrid Centeno, Kirsten Caress, Susie Longboy and the rest of the concession stand team have worked tirelessly all year long and their efforts help not only with fundraising but very importantly they make the day at the ballpark even more enjoyable. This year Mark Caress was appointed as the Club’s Shop Manager. In addition to the club’s online shop, Mark set up a relationship with suppliers to supply customised jackets and batting practice jerseys. These proved to be very popular. Mark also imported discounted high quality baseball products which are difficult to find in the UK. This generated sales of £1,621 for the year. 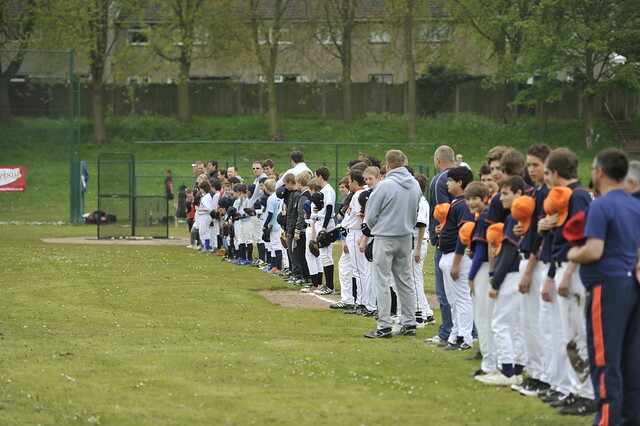 This year the club continued to stage the biggest and best events in British Baseball. The Herts Spring League and the Herts Futures Tournament once again had record number of teams entering and both have proven to be very successful in raising funds which can be invested in the ballpark or other projects. Other events included the BBF National Baseball Championships (event was staffed by the GB Team programme), the U17 and U14 Southern Playoffs and the U17 BBF Final, the NBL Special Event in July, and the Hunlock Series which saw a new format and received good reviews. The merging of all online activities at the end of last year has proven to be a big success. This combined with the intensive activity on facebook and twitter has generated record traffic for the Herts Baseball website. Number of visits increased by 48%, unique visitors by 33%, and pageviews by 32%, while average visit duration has gone up by 7%. The top most read articles of 2012 were “NBL’s best pitcher joins Herts” and “Herts acquire catcher from Florida”. We cannot remember a player transaction in recent British baseball history which has attracted as much attention as the acquisition of Robbie Unsell. In third place was “2012 national champions to be decided this weekend in Herts”. The club combined forces with BSUK to run 8 taster sessions in St Albans throughout the summer months. Dave Tretheway, Ryan Bird and Theo Scheepers were instrumental acting as coaches at these sessions. The club has now built a significant mailing list of people interested in playing softball and the task for the club now is to put a strong team to drive the project forward and take advantage of some real growth opportunities in the region.